There are drugstore beauty products you use even though they’re not as good as your luxury favorite simply because you’re trying to stick to a budget… and then there are the ones you use because they’re legitimately just as good. 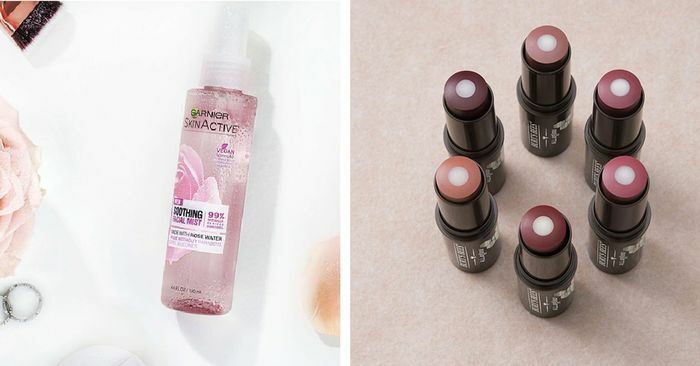 Sometimes $15-and-under beauty products beat the odds and just nail the formulations, colors, and packaging as well (if not better) than their pricier counterparts. Over the years, I’ve come across a handful of these serums, mascaras, and shampoos—drugstore beauty products I continue to use even though I have access to the most luxurious brands in the world. This list is dedicated to those makeup, skincare, and haircare products (some new, some classic) I recommend giving a try. Below, find 15 high-end products I absolutely love, as well as 15 cheaper alternatives I stan just as much. Every time I wash my blonde hair with this (delightfully non-stinky, non-drying) purple shampoo, people ask if I got my hair re-highlighted. As long as this beautifully packaged bottle is on the market, I’ll never spend more than $12 on toning shampoo again. I swear by glycolic acid treatments to keep dull skin and breakouts at bay, and this $15 toner proves you don’t need to blow your budget to reap the ingredient’s benefits. The product smells like subtly like flowers, looks beautiful on my countertop, and leaves my skin consistently radiant (I use it about four times a week after cleansing and before moisturizing). Sold. I discovered this blush-highlighter hybrid from ’90s throwback brand Hard Candy a few years ago and keep coming back to it. The product is as pigmented as blushes four times the price, and the color gradient of bright coral to glowy pinkish-white leaves a luminous finish on the cheeks that I just can’t quit. I’ve been dealing with the worst dry patches lately, and this new exfoliator from Bliss works shockingly well to clear dead skin and flakiness, leaving only plump, hydrated skin. The product, which has a jelly-like texture, is really gentle, though—no harsh, irritating ingredients. Just skin-loving goodies like fruit enzymes, cellulose, vitamin B5, niacinamide, and sodium hyaluronate (aka hyaluronic acid). This sleeper hit dry shampoo has a super-fine mist that soaks up grease without leaving a thick white residue. I also love that it smells fresh but not too overpowering, so you don’t smell super strong all day like other pricier dry shampoos. I exclusively use cream highlighters, and I’m super impressed by these sticks by Burt’s Bees (which come in both highlighter and blush form). They have a clear hydrating core in the middle, so they blend beautifully and allow for a natural, lit-from-within glow. Makeup artists and beauty editors were all instantly obsessed when L’Oréal came out with this pretty pink tube of mascara last year. It leaves lashes fluffy and feathery thanks to its fiber wand, which delivers a ton of product to each lash without them looking clumpy. More proof that nontoxic skincare doesn’t have to be expensive. I keep this vegan and 99% natural rosewater spray in my travel bag because it’s super versatile. I use it to dampen my Beautyblender for makeup, as a micellar water to take off my makeup, and as a refreshing mist throughout the day. I basically only ever want to use liquid eye shadows that don’t require brushes to apply, and this unique pick is a favorite, drugstore or not. It’s essentially a lipgloss for your eye—apply it alone for a subtle wash of shimmer or on top of another eye shadow to make it glow. It goes on like a liquid but dries down for crease-free long wear. I’m obsessed with the shades, too, especially the luminescent yellow and pink. This is a little pricier for a drugstore buy, but what can I say? It’s French. This gentle cleansing lotion is one of my all-time favorite face washes—it leaves my skin clean but also unbelievably soft. Say hello to my holy-grail sunscreen (which, if you’ve read any of my SPF stories on Who What Wear before, you already know). This Japanese-made product is so thin, sheer, and fast-absorbing it’s hard to believe there’s any sunscreen in it at all (but trust me, there is!). Every time someone I know goes to Japan, I beg them to stock up. There’s simply no sunscreen in the U.S., not even the priciest ones, that I prefer over this. It’s simply silly to spend more than $8 on falsies when so many makeup artists and beauty editors agree these are the best. I love the flexible strip and natural fluttery look of these lashes, which are easy to apply, comfortable to wear, and just plain pretty. Expensive eye glosses, face glosses, and lipglosses are super trendy right now, but a $4 tube of Aquaphor will give you the same results. Not only does this stuff work wonders to heal dry lips, but you can also tap it on top of your cheekbones and over your eye shadow for that au courant dewy skin look everybody’s loving right now. You’ll be hard-pressed to find a more sustainably made, nontoxic body lotion than EO’s. It’s made with 100% natural plant ingredients and fragrances (and smells incredible, like fresh lavender). It absorbs quicker than most natural lotions and leaves the skin impossibly smooth. Not to mention $15 for 32 ounces? Incredible.